A master's degree in school counseling prepares graduates to pursue a rewarding professional career in an important and growing field. Across the country, aspiring counselors can find a variety of school counseling programs offering competitive tuition. Increasingly, students are pursuing their master's degree in school counseling online, a convenient and affordable option for students from all backgrounds. While searching for schools, it is important to separate affordable programs from cheap schools. Affordability is a key concern for students, and to be sure, distance learners should avoid colleges that charge too much in tuition or fees. But it's just as important to find a quality program. Prospective students must do their homework, and avoid diploma mills selling the cheapest online master's in school counseling degree you can find: these schools offer poor instruction and carry little credibility on the job market. 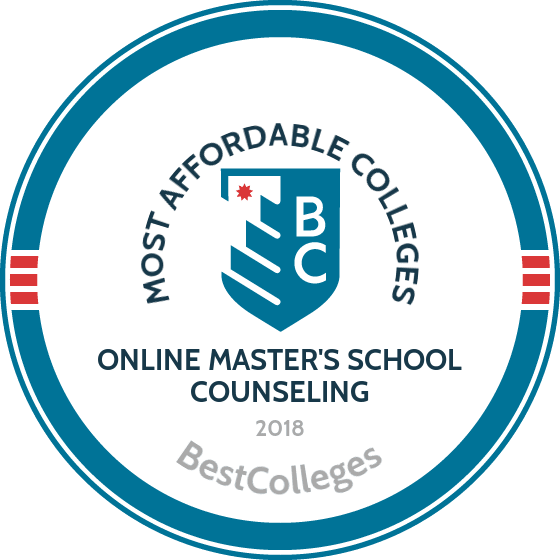 Below, we've ranked the most affordable online master's in school counseling programs in the country. We built the list with help from our "College Affordability Score" algorithm, which measures how student-friendly schools are financially. We considered a variety of factors, including return on investment, the amount of financial aid awarded to students, the amount of students entering loan agreements, and the number of students who are able to repay their loans. The following colleges offer the best blend of academic quality and affordability. UMass-Boston, one of the largest schools in the Massachusetts’ public university system, has a growing virtual campus. The institution offers dozens of degrees and certificates online, including a master’s in school counseling online. The program is taught in a hybrid format – most work can be done asynchronously through the web, but students are required to do a residency at UMass Dartmouth in their first semester. This two-week summer immersion gives participants the opportunity to meet their professors, get to know their cohort peers, and work on clinical material. The master of education in school counseling program follows a 60-credit curriculum, and all online students are required to take at least three classes per semester. Students split their time between traditional counseling coursework and field practicums, which can be done locally. Some classes are conducted in real-time. UMass-Boston is regionally accredited by the New England Association for Schools and Colleges, and the program is further accredited by the prestigious Masters in Psychology and Counseling Accreditation Council. Graduates will have completed all the required credits to obtain licensure in Massachusetts; students should check the guidelines for the state they intend to practice in. The University of Missouri – Columbia provides distance learning programs through Mizzou Online. Dozens of degrees are available through Mizzou Online, including an online master’s degree in school guidance and counseling. Offered by the university’s Department of Educational, School, and Counseling Psychology, the 34-credit program can be pursued entirely online. The curriculum is designed to give teachers and counselors the tools to promote positive mental health among children and adolescents. Coursework includes identifying and managing atypical behaviors; addressing diversity issues in schools; communicating with parents, children, and school staff; and effective intervention strategies and resources. Students in the master of education in educational, school, and counseling psychology program typically take one or two classes per semester, including summers, and graduate in two years. Online learners at Mizzou pay in-state tuition rates. Veterans and military personnel may be eligible for grants. The program does not lead to any certification or licensure. NYU offers a master’s in guidance counseling online through its online Counseling@NYU department. The 48-credit program is part of the school’s Department of Applied Psychology, and it offers a bilingual concentration option. The online master of arts in guidance and counseling degree emphasizes the emotional, social, and academic development of children in a school setting. Most credits can be earned online, but a three- or four-day residency in New York is required. The program uses the American School Counseling Association National Model as the basis for its curriculum. The program is designed to be completed in 18 months (full time) or 33 months (part time). Coursework is offered asynchronously and in weekly live class discussions. Students are required to complete a 100-hour practicum and 600-hour internship in a local, pre-K-12 school. Admission is open to anyone with a baccalaureate degree. The GRE is not required. Wake Forest, located in Winston-Salem, North Carolina, offers an online master of arts in school counseling that's designed to hone student's people skills through the study of communication, listening, guidance, and human development. Graduates are prepared to obtain licensure. Since 1996, when the Council for Accreditation of Counseling and Related Educational Programs (CACREP) began accrediting this program, 100% of Wake Forest’s counseling graduates have passed the National Counselor Exam. Wake Forest’s master's in school counseling online requires 60 credits, which can be earned in three years. The curriculum is divided into three sections: foundation courses (12 credits), core courses (18 credits), and counseling-specific classes (18 credits). Up to six credits may be transferred into the program. A 200-hour practicum and a 300-hour internship give students the chance to put their skills into practice. Most classes are offered asynchronously, but there are two or three required residencies, typically scheduled for weekends. Lehigh has offered distance education to working professionals for more than twenty years. The Bethlehem, Pennsylvania, university offers a master's in guidance counseling online that takes a multicultural approach. The master's of education in international counseling is built on a social justice framework. The 30-credit program focuses on developing an understanding of how third-culture experience impacts education and how to help students and families in this transitionary time. The program is offered in a hybrid format. Students complete coursework online in the fall and spring semesters and partake in residencies on campus in the summer. Learners have the opportunity to complete a summer residency in Greece during even years. Coursework includes culture-centered career intervention and diversity and multicultural perspective. Students take at least two internships throughout their studies. A maximum of six credits may be transferred into the program. Students who want to obtain licensure must complete at least 60 credits. Applicants must submit transcripts for all previous educational experiences and should have an undergraduate degree with a minimum 3.0 GPA. Two letters of recommendation and a personal essay are also required. Fort Hays State University offers more than fifty programs to over 6,000 students through its Virtual College. Based in Fort Hays, Kansas, the school offers an affordable online master’s in school counseling that prepares graduates for licensure. Most of the program can be completed online, but five on-campus workshops are required. Students typically earn their degree in four semesters. The master of science in school psychology requires students to earn at least 30 credits, including a professional seminar in psychology. Course subjects include the appraisal of children, experimental methods, developmental ethics, and behavioral therapy. The Virtual College uses asynchronous teaching tools like DVDs, CD-ROMs, the internet, and guided studies. Some courses include synchronous coursework. Tuition is among the lowest in the nation for graduate-level work. Fort Hayes also offers a more advanced education specialist in school psychology degree that is open to graduates of the MS in school psych program. Oregon State is an internationally known research institution that's based in Salem. The Oregon State Ecampus offers a master’s in educational counseling online that's accredited by CACREP, the National Council for Accreditation of Teacher Education, and Oregon’s Teacher Standards and Practices Commission. The master of counseling: school counseling program adheres to a 75-credit curriculum that prepares graduates to provide counseling to groups and individuals. The curriculum explores consultation and systemic change and leadership, action, and advocacy in the school setting. The program is taught through a hybrid format, with half of the credits coming from online coursework and the other half through on-campus sessions. The on-campus requirements are taught two weekends per term. The online practicum and internship courses, which take place during the second and third year, are synchronous and require students to meet in virtual classrooms at scheduled times. The program is competitive; only twelve students are admitted into the cohort each year. Applicants are judged on their academic background, volunteerism, personal suitability, and their professional goals. Creighton is a Jesuit university with a tradition of service. The school has years of experience in web-based education. From its campus in Omaha, Nebraska, the Catholic institution hosts a master of science in school counseling and preventative mental health. The degree can be customized with concentrations in elementary education, secondary ed, and pre-K and kindergarten guidance. The 36-credit program is based on the standards set by the American School Counselor Association. Creighton’s master’s in school counseling online is designed to work within the busy schedules of working professionals. Courses are delivered through accelerated eight-week sessions, and students can usually finish the program within two years. There are fifteen core courses, and students take three or four more classes in their chosen specialty. Out-of-state students who don’t have a teaching certificates must complete two practicums. The program culminates with a nine-month internship. Applicants must have a bachelor’s from an accredited institution with a minimum 3.0 GPA, three letters of recommendation, a personal statement, and a resume. A personal interview and two background checks are also required. Chadron State, a public institution located in Chadron, Nebraska, offers many graduate programs through its virtual campus, including a master’s in educational counseling online. The curriculum of the master of education in school counseling program was designed to prepare graduates for work in grades K-12 in public and private schools. The program is offered in a hybrid format. Students earn most of the 39 credits online, but they are expected to be on campus to participate in four courses: counseling and communication skills, group counseling, the practicum in counseling, and the internship in counseling. Students are also expected to be present for the opening orientation program and the counseling interview. Learners complete an internship of at least 450 hours and must pass the Praxis II exam to graduate. Applicants must have a bachelor’s in education or have completed an alternative teacher certification that included student teaching. The University of Louisiana at Monroe calls its virtual campus eULM, which provides access to programming from the associate to the doctoral level. The Monroe institution offers an online master's degree in school guidance and counseling as part of its broader MS in counseling program. Graduates of the school counseling concentration will have met the standards required by the state of Louisiana for licensure. The program emphasizes diversity by creating a supportive and collaborative environment for students of all backgrounds. Students are prepared to promote mental health and academic success in diverse school populations. The master of science in counseling has a 72-credit curriculum and is approved by the CACREP. The program is built around a core of 20 courses. The concentration in school counseling adds an additional 12 credits in training that's specific to academic settings. ULM has a generous transfer policy, and it also awards credit for professional experience through its Prior Learning Assessment. The ideal applicant has a bachelor’s degree from an accredited university with a minimum 2.80 GPA and combined GRE scores of at least 900 on the verbal and quantitative tests. Salem College is a liberal arts school in Winston-Salem, North Carolina. It’s the oldest continuously operating women’s college in the nation. Today, it has a thriving virtual campus that accepts men. The college’s online master’s in school counseling is cohort based. Students move through the program with a group of peers, generally finishing in three years. Most of the required 48 credits can be pursued online, but participants are required to attend two weekend seminars on the school’s campus. Coursework in the master of education in school counseling program immerses students in subjects like assessment and evaluation, advocacy, legal issues, ethics, and one-on-one counseling. The curriculum is research-driven, and students participate in a professional research seminar near the end of the program. They must also complete a 100-hour practicum in school counseling and a 600-hour internship. Graduates who successfully complete the program and achieve a minimum score on the Praxis II exam are eligible for licensure in North Carolina. UCA, located in Conway, has been offering distance education for almost a century. The university sponsors a master’s in educational counseling online that prepares graduates to step into leadership positions in K-12 educational settings. The program is available in two tracks: one for teachers who currently hold an Arkansas teaching license and one for students who don’t. Most of the academic work can be completed online, but the practicum and internship must be done on campus. The 48-credit curriculum of the master of science in school counseling gives students a broad overview of counseling and guidance, including individual and group counseling and developmental and career guidance. It also delves deep into educational assessment, theory, and research. Coursework follows an asynchronous format, and all classes must be passed with a minimum 3.0 GPA. No more than nine credits can be earned with a C. Students must pass the state licensure test or the program’s alternative assessment. Admission requires a baccalaureate degree or GRE or Praxis Core Academic Skills for Educators tests in reading, writing, and math if the student is unlicensed. Seton Hall, one of the nation’s leading Catholic universities, offers a master’s in school counseling online that prepares graduates to work in culturally and ethnically diverse academic communities. The 48-credit program is approved by the New Jersey Department of Education, and the university’s College of Education and Human Services is NCATE accredited. The curriculum of the master of school counseling program is based around foundational courses, clinical classes, and a field-practicum in a school setting. Students learn how to identify and assess developmental issues, empower children and families, and provide crisis intervention. The program is cohort based and begins with an orientation residency. A second campus visit is required during the second year. It typically takes eight semesters, or two and a half years, to earn a diploma. Applicants must submit secondary and post-secondary transcripts, GRE scores, three professional recommendations, a personal essay, and a resume. UND is the oldest and largest institution of higher learning in North Dakota, and it provides many web-based educational opportunities. More than 40 degrees at UND can be pursued through the internet, including an affordable online master’s in school counseling. The program is taught through a hybrid format, requiring four visits to the campus in Grand Forks during the two-and-a-half years it takes the typical full-time student to earn their degree. Many of the online classes are conducted synchronously, with live, interactive components. Graduates are eligible for licensure in North Dakota and other states. The 50-credit master of arts in counseling with an emphasis on school counseling program gives students a broad theoretical foundation in counseling. The curriculum adheres to the standards set by the American School Counselor Association’s National Model, and it focuses on social justice, diversity, and helping students from underserved communities. Online students pay in-state tuition and have access to tutoring, tech, library, and advising services. Southern Arkansas University, located in Magnolia, provides dozens of online degrees and more than 358 courses. Among its many offerings is an online master’s in school counseling that was modeled after the standards of the National Board for Certified Counselors and the Council for Accreditation of Counseling and Related Education Programs. The program fulfills most requirements for licensure in Arkansas and many other states. The master of education in school counseling curriculum requires 48 credits for completion, and most students can finish the degree requirements in three years by taking two classes per semester. A summer residency is used to get students acquainted with their peers and professors. A GPA of 3.0 must be maintained throughout the program, and participants must pass the Praxis and PLT exams to earn their degree. Prospective students must send a letter of application to the director of counselor education prior to admission. The University of the Cumberlands is affiliated with the Kentucky Baptist church and located in Williamsburg, Tennessee. The school offers dozens of online programs to working adults. School counseling is part of the university’s master’s in education degree, and it’s designed for working teachers and academic professionals. Most students already have a teaching license. The master of education program at UC follows a 45-credit curriculum, which immerses students in educational and developmental theory, advanced human behavior, psychological assessment, and more. Graduates have the experience to help young learners of multicultural backgrounds and diverse communities. After participants finish most of the online coursework, clinical assessments and internships begin. Graduation requires successful passage of the Professional School Counselor Praxis Exam and completion of an electronic portfolio. Applicants must submit transcripts from Praxis, GRE, and Miller’s Analogy exams; three favorable disposition surveys; a signed Kentucky code of ethics; and a writing sample. The University of Tennessee-Martin offers nine graduate programs that can be pursued through the web, including an online master’s degree in school guidance and counseling. The program is taught through a hybrid format; students must complete a four-day residency on campus to fulfill all requirements. Most coursework is online and delivered in an asynchronous format. Students interested in working in an academic setting enroll in the master of science in counseling and select the school counseling concentration. The curriculum explores educational therapy, taking participants through human growth and development, professional and ethical issues, group dynamics, crisis intervention, and individual appraisal. Students complete two internships under observation, one in an elementary school and the other in a secondary setting. All graduate students are required to pass a comprehensive written exam in their final semester in order to be eligible to earn a diploma. Gallaudet’s online master’s in school counseling is a hybrid program that includes three summer visits to the university’s campus in the District of Columbia. It has a multicultural emphasis and gives priority to current professionals and students who have worked with people who are deaf and hard of hearing. The program typically takes three years to complete, with six semesters of online work scheduled around the three residencies. The CACREP provides accreditation, and participants can take the National Counselor Exam in their last semester. The 63-credit online counseling program is rigorous. Students must have at least two years of experience working with children, preferably in schools. They must also have nine credits of psychology at the undergraduate level, including courses in child/adolescent psych or human development and abnormal psych. Applicants should submit college transcripts, four counseling-related essays, and three letters of recommendation. An interview with one or more counseling faculty members is required. Indiana Wesleyan is an evangelical university that's located in Marion, Indiana. The school brings a Christ-centered perspective to its affordable online master’s in school counseling. The program links counseling theory and techniques, teaching students to meet the needs of kids in K-12 academia through Christian counsel. The program is accredited by CACREP and the Council of the Accreditation of Educational Preparations. Graduates will be recommended for licensure in their respective communities. The 48-credit curriculum is divided into sections. Participants must work their way through nine core counseling classes, three school counseling classes, one elective, one clinical class, two semesters of internships, and two-weekend intensive residencies. Most coursework is asynchronous. Prerequisites include six hours of previous psychology study and six hours of Bible study. Applicants must have held a minimum 3.0 GPA in undergraduate studies. They must also submit GRE scores, three letters of recommendation, and a writing sample. Gwynedd Mercy, a private, Catholic university in suburban Philadelphia, is a comprehensive institution. The school offers a wide array of graduate programs through its virtual campus, including an online master’s in school counseling. Gwynedd Mercy’s master of science in school counseling program is based on the American School Counselor Association national model and preps graduates for certification. The program emphasizes professional development and gives students the tools to provide children with academic, emotional, social, and developmental guidance. Gwynedd Mercy prides itself on individualized attention, and the average online class has 17 or fewer students enrolled. The 48-credit curriculum is pursued through an accelerated format. A 100-hour practicum and two 210-hour internships (preK-8 and 9-12) are required. Applicants should submit proof of an undergraduate degree with a minimum 3.0 GPA, two references, a resume, and a writing sample. The university also offers an online graduate counseling certification program and schedules periodic virtual open houses. Adams State was founded as a teacher’s college and offers a master's in school counseling. The Alamosa, Colorado, institution offers a competitive online program that prepares students for licensure in Colorado and other states. The 60-hour program, accredited by CACREP, gives students a deep understanding of counseling, consulting, advocacy, and collaboration with parents and the community. Adams State calls its master of arts in counseling an “Online Plus” program, which is offered in a hybrid format. Students join a cohort and proceed with the group through seven or eight semesters over the course of two-and-a-half years. Most coursework is completed online in an asynchronous format. One-week residencies are required during the two summers. Candidates can do their internships locally under supervision. The GRE is not required. Mercy is a non-sectarian, mid-sized institution in Dobb’s Ferry, New York. The university’s School of Social and Behavioral Sciences offers an online master’s in guidance and counseling that meets the professional and ethical guidelines required for school counseling in the state of New York. Students can elect to take a general track or a bilingual track. Graduates of the latter are recommended for provisional certification in counseling. The 48-credit master of science in counseling curriculum explores the field from a variety of angles, including group dynamics, career development, ethical implications, multiculturalism, evaluation, and practical application. Students complete 30 core credits, three electives, three college planning and preparation credits, and two internships. The bilingual option requires an additional three credits, and the students must demonstrate proficiency in the target language. Concordia University-Wisconsin is part of the Concordia system, a consortium of ten universities operated by the Lutheran Church. Located in Mequon, CUW offers an online master’s in counseling that is among the highest ranked in the nation. Graduates are eligible for licensing in Wisconsin. The 45-credit master of science in education/counseling curriculum provides a broad overview of counseling, including personality development, testing and analysis, group dynamics, social learning, and biologic traits. Online learning at Concordia includes real-time, cohort-based courses and solo, asynchronous work that's completed at the student’s convenience. Two classes, individual counseling and group counseling, are offered on-campus only. Students are expected to complete two practicums and three courses of portfolio creation, usually at the end of the two-year program. CUW offers a 25% discount to educators from Christian schools. The University of the Southwest’s online master’s in school counseling can be completed entirely online. The school is a private, Christian university that's located in Hobbs, New Mexico. The 42-credit program prepares graduates for licensure in New Mexico. The necessary internships and practicum can be fulfilled at an approved local facility. The program focuses on children in the school setting and how social, institutional, and environmental barriers can impede their academic and personal development. The master of science in education/school counseling degree includes a 12-credit core curriculum and six credits in electives, like play therapy and addictions counseling. Students can expect to study 15-20 hours per week for each course. The Higher Learning Commission provides accreditation. USW has one of the lowest tuition rates among schools in the Council for Christian Colleges and Universities. Lamar University, a member of the Texas state university system, offers an affordable online master’s in school counseling that prepares graduates to help young learners who are struggling emotionally, academically, socially, and developmentally. Participants learn how to provide guidance at each developmental stage, and they have an opportunity to put theory into practice with a fifteen-week practicum. Two five-day residencies on the university’s Beaumont campus are required. Students are expected to have at least two years of experience. Courses in the master of education in school counseling online program are offered in accelerated eight-week sessions or fifteen-week terms, and the degree can be earned in less than two years. Multiple start dates are offered. Admission requirements include an undergraduate degree with a minimum GPA of 2.5. Students with a 3.0 GPA or better are not required to submit GRE scores. Texas applicants must have a valid teaching certificate.